Here's the other Potsie. I mean Ponzi. 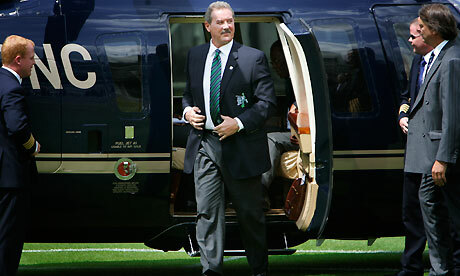 Allen Stanford, the Texan financier, knight of Antigua, Washington power player and billionaire benefactor of English cricket, has been found guilty of orchestrating a $7bn Ponzi scheme. US politicians, the authorities in Antigua and the England and Wales Cricket Board were all left red-faced by their associations with Stanford. With investors still reeling from the revelations about Bernard Madoff's historic Ponzi scheme, Stanford had become a media sensation. Billions were said to be missing and investors were panicking in cities from Houston to London, Caracas to Switzerland. $7 billion - that is significant. Did those investors get 50cents on the dollar? I think not. Deregulation opens the flood gates wide open for massive investment fraud that steals life savings and pensions, destabilizes the market and crashes economies.